CT Do Better: Exit Left! Of the 880 exits in Connecticut, 56 of them are on the left, according to the state Department of Transportation. That figure includes four left exits from High Occupancy Vehicle (HOV) lanes, and two from mainline routes to HOV lanes. 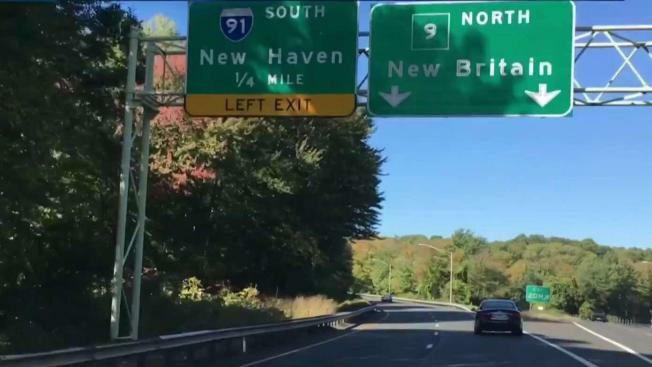 For Connecticut motorists, having to exit to the left when driving on our highways can rattle nerves, slow traffic and lead to close calls. So why does our state have more of these exits than other states? Massachusetts is the only other state in New England with a high number of left exits. Drivers will encounter 39 left exits in the Bay State, according to MASSDOT. By comparison, New Hampshire has five left exits. There are two in Rhode Island and Maine and Vermont do not have any. The reason is driver expectation, according to John Ivan, PhD, head of the Department of Civil & Environmental Engineering at the University of Connecticut. “We want to avoid surprising the driver because that just leads to unexpected maneuvers and that can be an unsafe condition,” Ivan said. But those guidelines didn’t exist when many of Connecticut’s main routes were built. "At that time there wasn't a lot of thought yet about how to design highways. They built them as they went," Ivan said. In addition, Ivan said a lot of Connecticut’s left exits were intended to connect to proposed highways that were never built. While right-hand exits are preferable, the DOT says there are challenges involved in moving a left exit to the right side of the highway. “Stand-alone, we generally don’t eliminate a left hand exit just for the sake of doing it. It can be costly, and have major impacts to established property owners, businesses and existing traffic operations,” DOT spokesperson Kevin Nursick wrote in an email. But Nursick said large-scale reconstruction projects are a different story. The $2 billion reconstruction of the Interstate 95 corridor in New Haven included shifting the traffic pattern at the Interstate 91 interchange to remove the left exits. “They were completely rebuilding it and so they had the opportunity to do whatever they wanted. And they had the land to take care of it," Ivan said. One of the designs under consideration for the reconstruction of Interstate 84 through Hartford, known as the Lowered Highway Alternative, would eliminate all left exits from Sisson Avenue to the tunnel.